The staff of a Seattle homeless activist group is being kicked out of three city-funded tiny-house villages in an increasingly acrimonious dispute over how the camps are run. As a result, longtime homeless activist Scott Morrow and others involved with the nonprofit Nickelsville will no longer draw salaries through city contracts with the Low Income Housing Institute (LIHI), and they won’t have a role in managing the villages. Sharon Lee, executive director of LIHI, said Nickelsville had been “arbitrarily” barring homeless people from the camps, and was frustrated they had not required villagers to meet regularly with case managers, who are tasked with finding them permanent housing. “We feel it’s very important to take care of the families and singles and couples that are homeless and need support and help, and not be caught in this draconian management-operation system that they’ve created,” Lee said. The dispute is another blow to the group of activists who pioneered democratically-run tent camps and shelters in Seattle in the 1990s and 2000s. Nickelsville and its sister nonprofit, the Seattle Housing and Resource Effort (SHARE), are losing funding from City Hall, have left or been forced out of running many camps, and are not running the new tiny-house villages Seattle is opening to combat its growing homeless problem. Seattle has embraced tiny-house villages like no other city, with hundreds of people staying nightly in nine sites. Three of them are run — in Georgetown, Othello and Northlake — by Nickelsville, with a combined annual budget of over $1 million in city funding. But villages have been dogged by management problems, and Seattle last year closed the Licton Springs village, which allowed residents to drink and use drugs. The group wants a cooling-off period and then to go to mediation. LIHI wouldn’t agree to those terms in the meeting with Nickelsville leaders last week. LIHI has been pushing to require campers to visit with case managers to speed up the process of getting them into housing; current rules require campers only meet with a case manager at the beginning of their stay. Nickelsville leaders contend that shouldn’t be required, and there isn’t enough affordable housing to make those meetings meaningful anyway. The city shares LIHI’s concerns and has been pushing for all camps to operate with case management, said Will Lemke, a city spokesperson. Nickelsville’s leaders have often been at odds with City Hall; they named their camp Nickelsville in 2008 after former Seattle Mayor Greg Nickels to protest his cleanups of homeless camps. When campers and supporters refused to move from a Port of Seattle property in late 2009, police showed up and arrested a dozen of them. Political infighting is not new to these camps and villages. In 2015, Nickelsville’s camp in the Chinatown International District voted to cut ties with Scott Morrow, who residents said had threatened to take away their toilets and other resources. When LIHI and the camp’s host church threatened to abandon the encampment, Morrow was reinstated. Nickelsville operates on a self-management model. A triumvirate elected by the residents runs the camp, and residents take weekly security shifts, bookkeeping duties, or kitchen cleanup. Residents who don’t hold up the contract they sign on entry are kicked out. As Seattle’s homeless crisis grew, the city permitted camps to exist legally. But instead of contracting directly with Nickelsville or SHARE — who the city has investigated in the past for using an unlicensed accountant or allegedly misusing funds — the city has brought LIHI on as a fiscal sponsor. That’s where relationships have chafed. Nickelsville’s supporters believe their self-management model asks homeless people to learn responsibility, become part of a community and learn consequences for their actions. But LIHI’s philosophy is that housing is a human right, and that barring people for breaking rules puts them back on the streets. 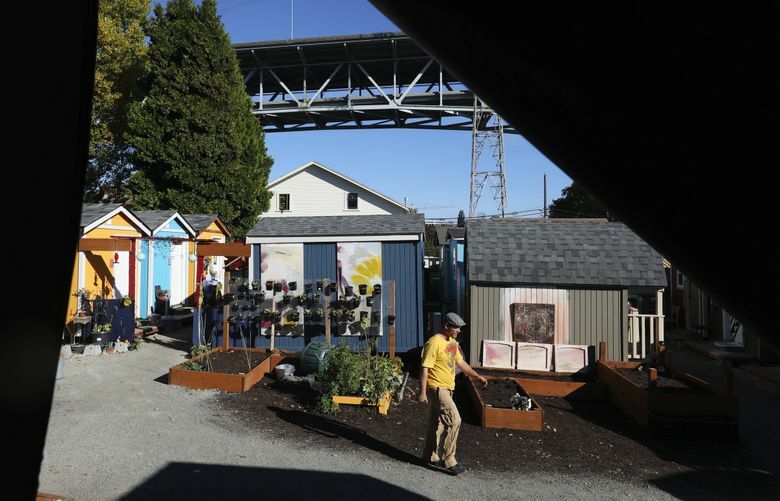 Last year, Seattle’s nine city-sanctioned tiny-house villages served 658 people. According to city data, 33 percent of the households who left villages obtained permanent housing, a rate that is higher than both basic homeless shelters and the city’s favored “enhanced” shelter model, which have more services on-site. Lee said Nickelsville will now operate like LIHI’s other democratically-run camps in Interbay and West Seattle. She gave Nickelsville leaders one week to wind down operations at the three villages and hand over records and rosters by Monday. A previous version of this article misstated the city’s exit data from tiny-house villages. It refers to households, not people, who left villages and obtained permanent housing. It also misstated the name of the organization known as SHARE, which is the Seattle Housing and Resource Effort.